Amish Shed | Erie, PA - A & J's INC. 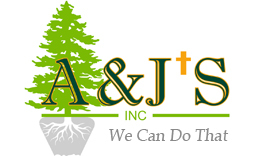 Welcome to A & J’s Inc., a full-service tree nursery that is dedicated to customer satisfaction. 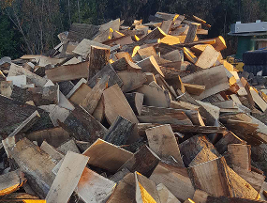 Our company is your reliable source for high-quality wood varieties, as well as for firewood, mulch, and even handcrafted Amish sheds in Erie, Pennsylvania. When you’re looking for superior service and competitive rates, reach out to our company. Our beautiful, large evergreen trees are ideal for numerous landscaping purposes. One of our business’s unique services is our made-to-order Amish sheds. We use our homegrown wood to produced durable, attractive structures that are practical additions to any property. Our custom sheds are multipurpose solutions that we build on-site if you’re at a hard-to-access location. In addition, select sheds are backed by a 30-year warranty. When you’re in the market for a new shed, our quality and service can’t be beaten. Find out more by calling us today. When you’re shopping for trees to update your landscaping, you can’t go wrong with what we have to offer at our tree farm. Our variety of trees has something for everyone. From homeowners to business owners, our satisfied customers always receive a great product at an excellent value. We’re ready and waiting to talk to you about the beautiful trees and flowers that are available at our nursery. We’re confident that our wholesale nursery has exactly what you’re looking for. As a family-owned business, we believe in treating customers right by selling only top-quality products. Receive the courteous service you deserve by making your next purchase with us. 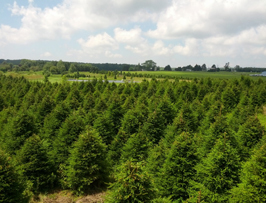 We are one of the only companies in America to sell evergreens as large as 50 feet tall! Learn about our high-grade trees, Christmas decor, and more. We install our large trees for you for an affordable price. Our beautiful evergreens, spruce, pines, and other trees are sure to make a lovely addition to any home, garden, or business. Keep warm during the cold months with our supply of safe-to-burn firewood. It even works great for fire pits and bonfires. These durable Amish sheds are attractive, truly built to last, and a handy place to store tools, supplies, and much more. Why wait 20 years for a tree to grow when we've already grown it for you? Talk to our representatives about our nursery. As a Christian-based business, we combine high standards of business ethics and efficiency with the willingness to adapt to any customer’s specific needs. When you choose our company, you’ll be treated with respect and receive personalized customer care. We go above and beyond to ensure that our clients are satisfied with their trees, firewood, and Amish shed. Our owner, Adam, is a fourth-generation tree seller in this area, so you can rest assured you are in the best of hands. In fact, our individualized services and great products have customers coming back time and time again. Give us a call today to learn about our wide selection and budget-friendly prices. Contact us and let us know what you’re looking for. We proudly serve our customers in the Erie, Pennsylvania, area. "Blessed are those whose ways are blameless, who walk according to the law of the Lord. Blessed are those who keep his statutes and seek him; they do no wrong but follow his ways."